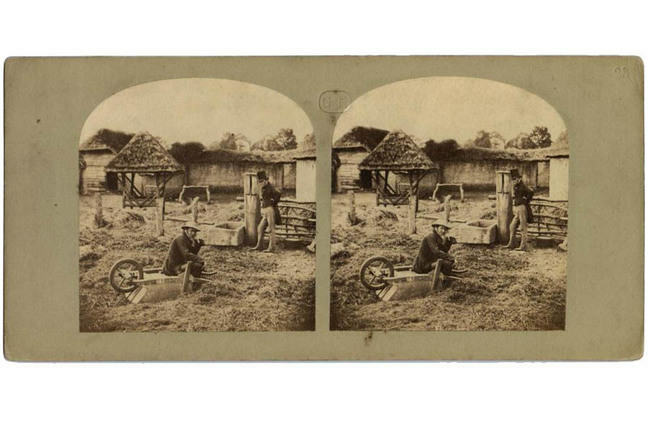 Stereocard entitled 'Early Morning- Drawing Water From the Well' by TR Williams, London, 1850 - 1855. IL.2003.44.6.7.88. 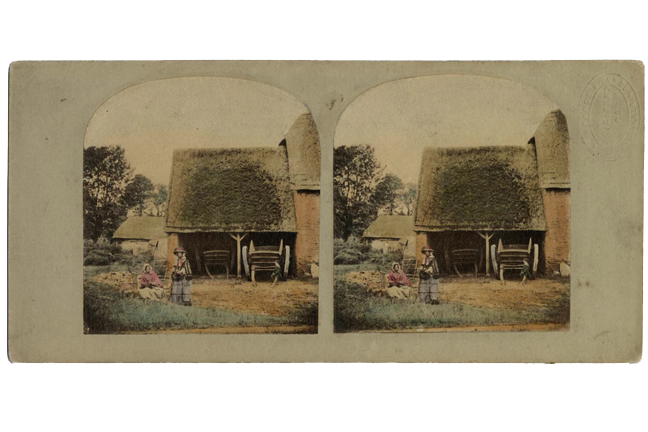 Some time in the 1850s TR Williams produced a series of 59 stereoviews entitled ‘Scenes in Our Village’ which presented a romanticised vision of 19th-century English rural life. As we heard from Dr Brian May in the video, after a period of anonymity the village featured throughout this series has now been identified as Hinton Waldrist. It was part of Berkshire until 1974 boundary changes transferred it to Oxfordshire. The village lies between Oxford and Faringdon. It was in this location that TR Williams spent part of his childhood and where, in 1847, he returned to solemnise his marriage to Elizabeth Gorfin. 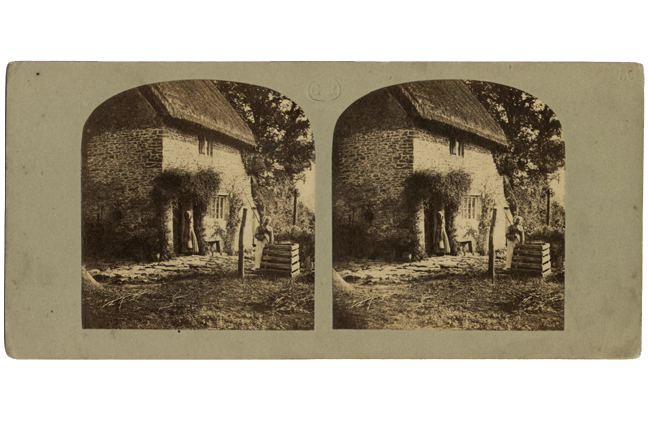 ‘Scenes in Our Village’ became commercially available by Christmas 1856 and were taken using the wet collodion method on glass. There are some glass positive transparencies in existence as well as the more typical card-mounted examples. The pictures in this series were given familial titles, including My Summer Haunt, The Road Through Our Village, The Dame and her Spinning Wheel, Maria Carson’s Washing-Day, A Gossip By The Way, Dame Edmunds’ Talkative Daughter and The First Warm Day In Spring, reflecting Williams’s emotional connection with the village. They also unusually featured descriptive verse printed on the reverse of the cards, most likely written by Williams himself. We have reproduced this in the caption for each stereocard. The stereocard above depicts John Sims at his pigsty - Dr Brian May was thrilled to find Sims’ gravestone in the church at Hinton Waldrist. 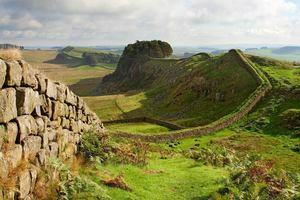 A Village Lost and Found: “Scenes in Our Village” by TR Williams. 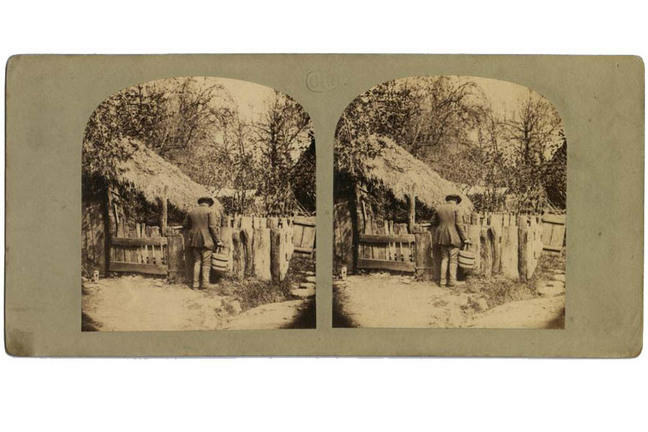 An Annotated Tour of the 1850s Series of Stereo Photographs by Brian May and Elena Vidal.